. . . And like I said yesterday, considering how much better this becomes when there are more instants to choose from, I guess we really can’t complain that they don’t make cards for larger formats any more! This looks pretty similar to Snapcaster Mage, albeit with a few wrinkles. The premise is similar: you cast a spell out of your graveyard. There are, of course, things that make Mission Briefing better and worse. First, you’re casting the spell properly, not using flashback as an activated ability on the spell. You also do not target a spell to give flashback…or target a spell at all, for the record. 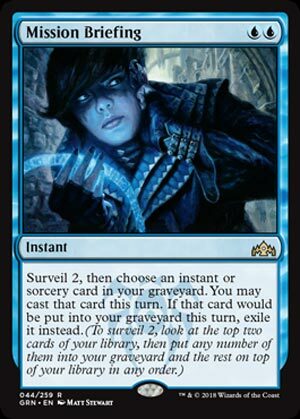 Mission Briefing can even put the spell into the graveyard for you to cast later, thanks to surveil 2 on the card; surveil replaces scry in this set, letting you put the card in your graveyard instead of on the bottom of your library. Regardless, you still have a one-turn window to cast the spell. All of these make Mission Briefing a powerful tool in a lot of decks.